As Tiger Woods PGA Tour dominates the golf game genre, it’s hard to remember there are other golf games out there. But Gameloft’s Real Golf 2011 proves there's more to the genre than Tiger. Real Golf 2011 for the iPhone offers realistic golf mechanics, stunning visuals and multiple gameplay options. Its touch interface could be improved, but overall the game is a worthy rival to the EA juggernaut. Vijay isn't aiming for the hole, but rather the caddy who owes him money. Real Golf lets you play as any of ten professional golfers. Playable golfers include Camilo Villegas, Greg Norman, Sergio Garcia, and Vijay Singh (my personal preference). Each player comes with stats that inform you of his/her putting and driving skills. Thankfully, the stats do seem to have a bearing on how well you perform in the game. The game offers ten courses for you to play, including the Evian Masters in France, The Harbour Town course in the United States, and the Kingston Health Golf Club course in Australia. You can play the game in Career mode (basically going on tour), Instant Play (a few holes of golf), Challenge mode (you have to golf within a certain par) and Free mode (which lets you set the parameters of your own golf game). You can play multiplayer via the Internet, Wifi or Bluetooth. Fans of EA's title will be especially pleased with Gameloft's multiplayer, as Tiger’s game doesn’t offer it. Ok, so you’re ready to golf. On the left side of your screen there is a small button that lets you choose your club. You don’t have to choose a club, mind you, as the game acts as an excellent caddy and usually preselects the best club before a swing. On the right of your screen, there is a map of the course. The map, taking into account weather conditions and your golfer’s current posture, will show you where your golf ball is likely to land if you don’t make adjustments to your golfer. You can adjust your golfer in two ways. By simply touching either the left or right side of your screen, you can make your golfer swing in either direction. Then, by clicking on a yellow button under the map, you will be able to see a force gage. By moving your finger to an appropriate numbered force on the gage, then moving it back to zero, you swing. The movement of your finger along the force meter is also recorded, so if you don’t move your finger straight, your gulf swing will be a little wobbly. I am a terrible golfer in real life. In Real Golf 2011, I am also a terrible golfer. The game feels like real golf and I got better playing it as time went on. Like with any sport, practice makes perfect. As I was learning the right golf moves, I did feel guilty ruining the reputation of Vijay Singh, but at least I got to learn from my mistakes. Singh unfortunately, wasn’t understanding, and I was treated to too many videos of him being upset about my subpar golfing technique. The game has one major bug. Occasionally, I had to touch game buttons several times before they would work. Luckily, most of the buttons with the problem are outside of normal gameplay. Graphically, the game is beautiful. Though it’s made for the iPhone 4’s retina display screen, my third generation iPod Touch rendered the game quite well. You can’t see individual grains of grass, but trees, player faces and clothing details all come out exceptionally well. The game’s sound quality is fine. I am pleased to say that the game allows you to play your iTune’s music during gameplay. Strangely however, you don’t get access to your entire iTune’s playlist. I do have one complaint with one of the game’s sounds. The game’s announcer’s play calls can get quite repetitive. Luckily, you can turn him off in the game’s menu. 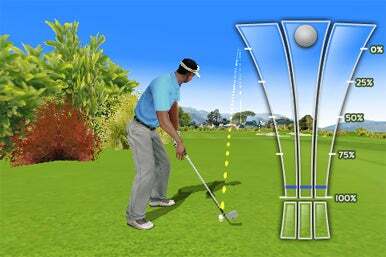 Real Golf 2011, with its great gameplay, excellent visuals and varied player options, is a strong option for those looking for a game golfing fix.